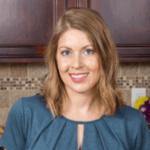 Published: Oct 29, 2018 · Modified: Apr 11, 2019 · By Jen Sobjack · This post may contain affiliate links. 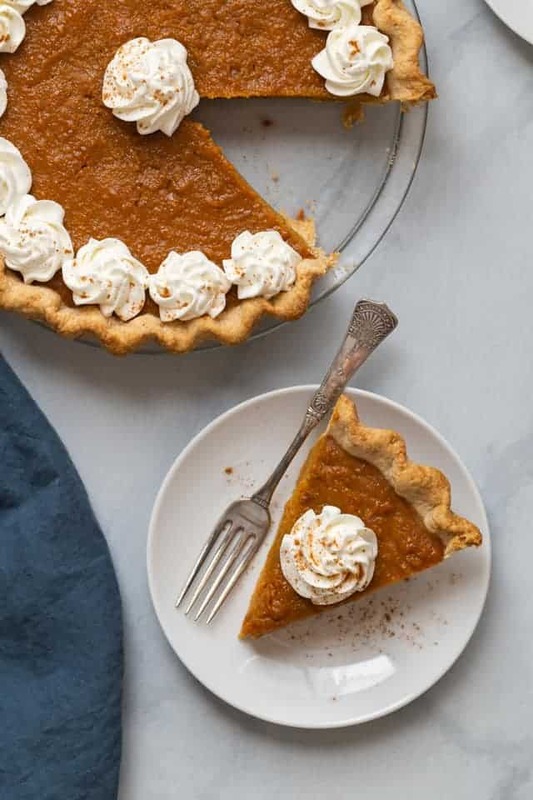 Lush sweet potato pie with the perfect balance of fall spices and brown butter will be a hit on your Thanksgiving day table! Remember this pumpkin pie? I turned that delicious silky pie into a sweet potato pie! And I really have no words to describe how incredible it is! I love sweet potatoes and I’ll order them/make them any chance I get. So I knew right away I wanted to make a pie with them. I used brown butter in the crust and the filling for added richness. I’ve been using brown butter in everything lately. The sweet nutty flavor pairs so well with all the fall spices. And it does something magical when mixed with sweet potatoes making this the best sweet potato pie recipe! What does sweet potato pie taste like? 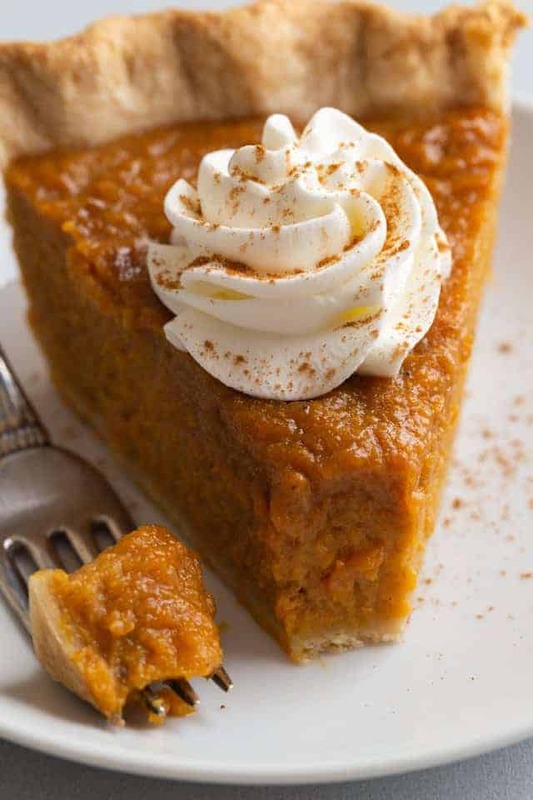 Sweet potato pie tastes very similar to pumpkin pie. 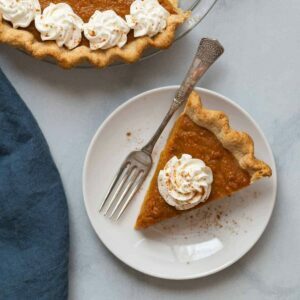 Of course, pumpkin and sweet potatoes have their own unique flavor but the spices used in each pie are the same. Everyone has their favorite spices to use and for sweet potato pie, I tend to stick with cinnamon and nutmeg. What goes in sweet potato pie? Naturally, you’re going to use sweet potatoes. The recipe I’m sharing with you today has brown butter, brown sugar, white sugar, eggs and egg yolks, cinnamon, nutmeg, salt, vanilla, and milk. When I make candied yams, I always use both white and brown sugars so I decided to use both in the pie and it turned out to be a great decision. 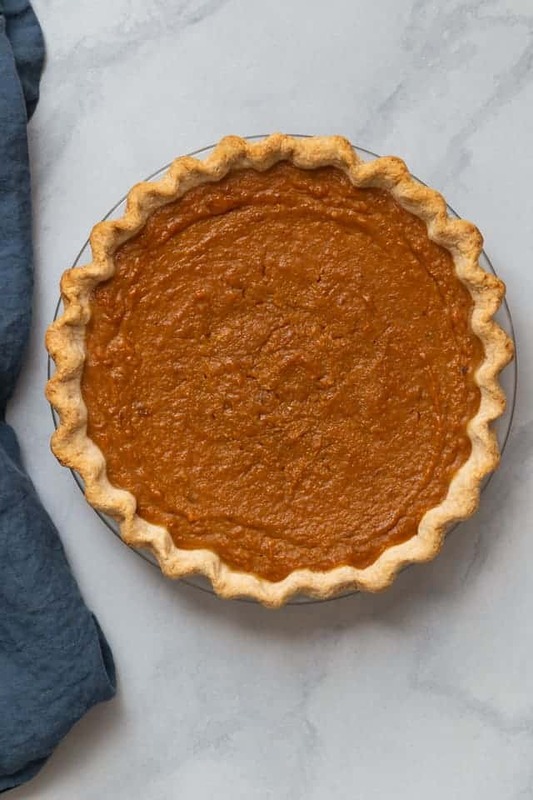 How to make sweet potato pie crust? Any type of sturdy crust will work. 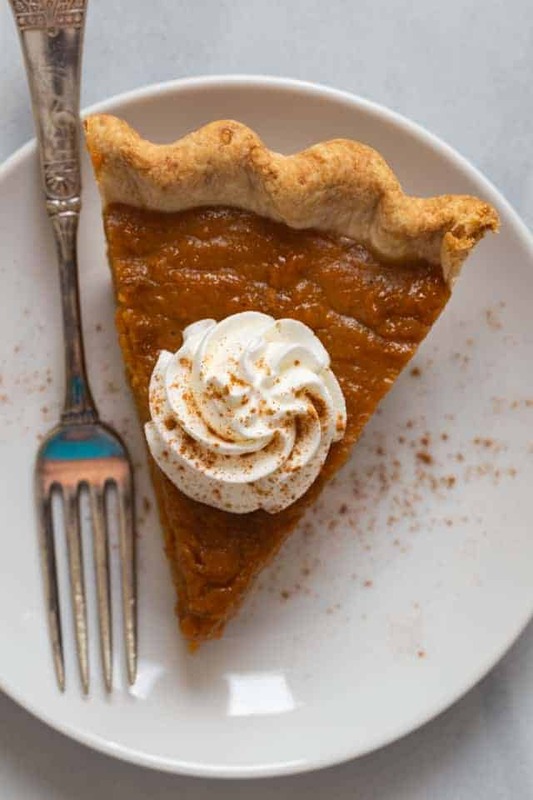 I love using my brown butter pie crust for fall-flavored pies. Brown butter is like a secret ingredient that gives the crust extra special flavor. I added shortening to the crust also. I often use a combination of shortening and butter because I find they each offer something unique. The butter adds flavor while the shortening makes the crust tender and flaky. Sometimes I’ll add an egg but I skipped it for today’s pie. The crust works best if it’s prebaked. This will prevent it from coming out soggy. How to make sweet potato pie? Before I even begin to make the crust, I like to roast the sweet potatoes. Most recipes call for peeling and boiling the sweet potatoes but I find them to be more flavorful when they are roasted whole. Just place them on a baking sheet and a bake them for about 50 minutes at 475°F. Let the potatoes cool slightly then you can cut them open and scoop out the pulp. Mash the pulp as best as you can. It’s okay if it’s not perfectly smooth, though. I actually like for my pie to have some texture and look a bit “rustic”. There’s no special technique for making the filling. I just toss everything a bowl and whisk it together. And remember, it doesn’t have to be perfectly smooth. You can see in the picture below, there are still lumps of sweet potato visible. The filling will be thick. It’s not quite as runny as my pumpkin pie filling. But it will still be super creamy after it bakes. Pour the filling into the prebaked crust and bake it for 40-50 minutes at 350°F. 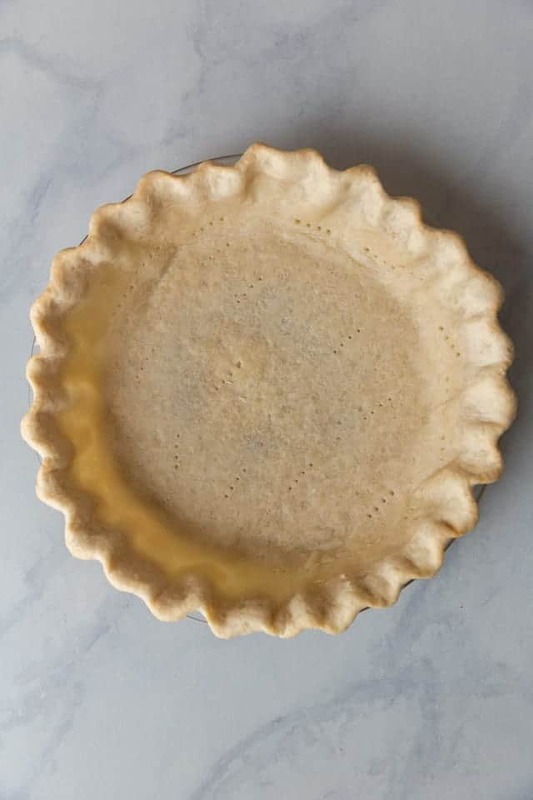 If you notice the crust browning too much before the pie is finished baking, you can cover it with a pie shield or some aluminum foil. How to tell when sweet potato pie is done? The pie is done once the filling has become firm around the outer edges but is still jiggly in the center. It will continue to set and firm up as it cools. Be careful not to overbake it. Overbaking is the main reason the filling will crack. If you look closely, you can see teeny tiny cracks in the middle of mine. I wasn’t watching it closely and let it bake a few minutes too long. Those cracks can easily be covered with whipped cream, though. How to store sweet potato pie? Once the pie has cooled completely, it should be covered and kept stored in the refrigerator. How long does sweet potato pie last? The baked and cooled pie will keep for up to 4 days stored in the refrigerator. It will also keep for up to 1 month in the freezer. How to freeze sweet potato pie? Make sure the pie is in a freezer safe pie plate. These disposable aluminum pie pans work great for this. They can be baked in the pan and then transferred to the freezer. Once the pie has cooled completely, wrap it tightly in several layers of plastic wrap. Make sure the plastic wrap is sealed all the way around. Then wrap the pie in a layer of aluminum foil and freeze the pie for up to 1 month. Allow the pie to thaw in the refrigerator overnight before serving. Heat the butter in a small saucepan over medium heat, whisk frequently. Continue to cook until melted. The butter will foam and then subside. Cook until brown bits develop in the bottom of the pan and the butter turns a light golden color, about 8 minutes. Remove from heat. Transfer 2 tablespoons of the brown butter to a small bowl and set aside for the filling. Line a small bowl with foil, letting some excess to hang over the sides. Pour the remaining brown butter into the bowl, leaving behind the dark bits in the bottom of the pot. Freeze for 1 hour. Combine the flour, sugar, and salt in a large mixing bowl. Using a pastry cutter or two knives cut the brown butter and shortening into the flour mixture just until coarse crumbs form. Don’t try to work it in too well. Large clumps are perfectly okay. Drizzle just enough ice water over the flour to moisten it. You will know you have enough liquid when you can squeeze the mixture and it holds together. Shape the dough into s ball and flatten into a disc. Wrap the disc with plastic wrap and refrigerate for at least 1 hour or up to 2 days. Roll the dough into a 12-inch circle. Place it in a 9-inch pie pan gently without stretching it. Trim the edge so there’s a 1-inch overhang over the sides of the pie pan. Fold the excess dough under so it sits up on the rim of the pan and flute as desired. Refrigerate the dough for 30 minutes. Meanwhile, adjust oven rack to middle position and heat oven to 375°F. Line the pie shell with parchment paper and evenly distribute about 2 cups metal or ceramic pie weights over the paper. Bake for 17 to 20 minutes then carefully remove paper and weights and bake for an additional 9 minutes, until the crust is lightly golden brown. Remove from oven; reduce oven temperature to 350°F. 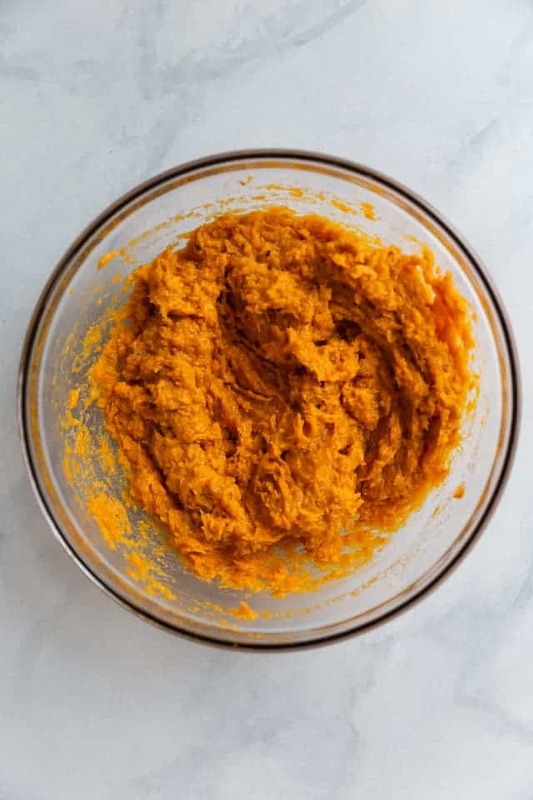 In a large bowl, mash the warm sweet potatoes with the reserved brown butter until only small lumps of potatoes remain; you should have about 2 cups of mashed sweet potatoes. Whisk the eggs, yolks, brown sugar, granulated sugar, cinnamon, nutmeg, and salt together in a medium bowl. Whisk in the vanilla and milk. 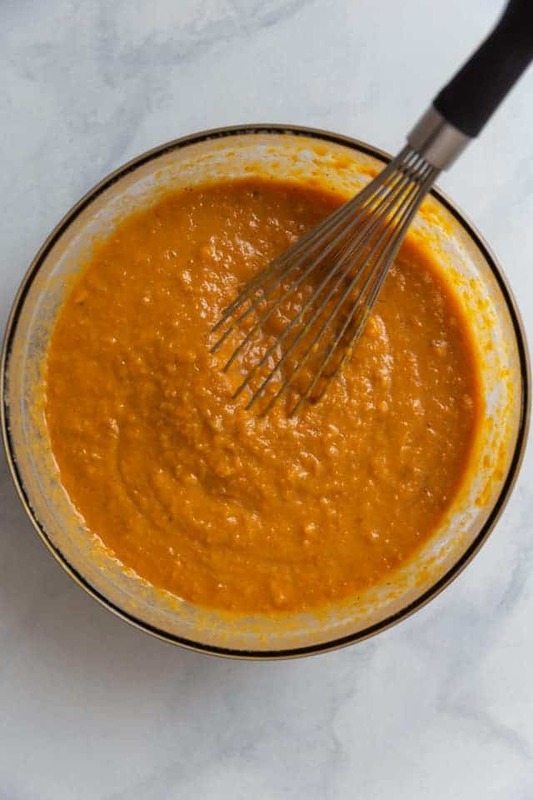 Gradually add egg mixture to sweet potatoes, whisking gently to combine. Pour the sweet potato mixture into the pie shell. Bake for 40-50 minutes, until the filling is set around edges but center jiggles slightly when shaken. Cover the edges with a pie shield or aluminum foil if they become too brown during baking. Transfer pie to wire rack and cool to room temperature, about 2 to 4 hours. Baked and cooled pie will keep for up to 4 days covered tightly and stored in the refrigerator. Baked and cooled pie will keep for up to 1 month wrapped tightly in several layers of plastic wrap and stored in the freezer. Thaw in the refrigerator overnight. The pie crust can be prepared up to 2 days in advance. Wrap tightly in plastic wrap and keep it refrigerated until ready to use. The filling can be prepared up to 1 day in advance. Cover it with plastic wrap and store it in the refrigerator until ready to assemble the pie. *If you choose to use a storebought crust or different crust recipe, you’ll need to brown 2 tablespoons of butter for the filling. Or you can use 2 tablespoons of unsalted butter in place of brown butter for the filling. For cooking the sweet potatoes, I like to bake mine for 50 minutes at 475°F. Let them cool slightly then scoop the pulp out of the skin. You can also peel, cube, and boil the potatoes until tender. Sounds & looks Delicious! I may try it but sounds a bit complex. Mention of the brown butter’s measurement/use for crust AND pie is confusing. It might be helpful to give measurement for crust and separate one for pie if one choses not to do crust recipe. Hi Milan! I wrote it that way because it’s easier to brown all the butter in one step instead of two. But, I have included a note in the recipe to address what to do if you choose not to use the crust recipe. I’ve always love sweet potato pie and this one sounds wonderful with brown butter!